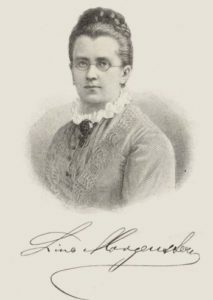 Lina Bauer (1830-1909) was born to a wealthy, religious German-Jewish family in Breslau (now Wroclaw, Poland). Her parents were noted social justice activists and philanthropists. Among other things, her father built an apartment building to provide housing for destitute workers, while her mother and aunts sought to save women from brothels and give them a proper education. Lina was raised with these important values. At just 18 years of age, amidst the wars of 1848, she established the Penny Society for Poor Pupils to raise money for shoes, clothes, and books for needy children. The organization would continue to operate for the next eighty years, providing countless children with basic necessities. Lina received an extensive education in music, literature, history, and science, and was so passionate about her studies that her mother wanted to take her out of school. Undeterred, Lina continued to study in secret at night. Meanwhile, she fell in love with a poor Polish Jew and married him in 1854 despite her parents’ wishes. The couple moved to Berlin and Lina (now Morgenstern) started to write to help pay the bills. Morgenstern was heavily influenced by the German thinker Friedrich Fröbel, famous for his concept of a “kindergarten” where small children can learn, play, and grow healthy and happy. Fröbel’s preschools did not go very far, and were even suppressed by the Prussian authorities. It wasn’t until Morgenstern co-founded the Berlin Women’s Association for the Advancement of Fröbelian Kindergartens that the idea took off. She chaired the organization for five years, during which time she established eight kindergartens, and a training academy for kindergarten educators. Fröbel’s other students established the first kindergartens in America, and the institution was soon adopted around the world. Morgenstern ultimately left her post to start a new charity: the Volksküche, or “people’s kitchen”. This organization distributed healthy meals to the poor, inspiring the thousands of soup kitchens that operate around the world today. Morgenstern herself opened up ten such kitchens, each serving as many as 2500 people per day! Morgenstern also published a number of important works on feminism, education, health, and child care. Her Das Paradies der Kindheit (“The Paradise of Childhood”) was the kindergarten textbook used globally for decades, and went through seven editions in her lifetime alone. Meanwhile, her Illustrated Universal Cooking Book – a result of all those years working in soup kitchens – was so popular that the Nazis did not include it in their Jewish book-burning list. Among the other organizations that Morgenstern founded are the School for Further Education of Young Ladies, the Berlin Housewives’ Association, the International Congress of Women, and the Berlin Society for Child Protection. During the Franco-Prussian War of 1870, she started a group for the care of soldiers, assisting some 60,000 troops. Morgenstern had become so popular and beloved that the German emperor and empress, Wilhelm and Augusta, visited her and became her patrons. Morgenstern was awarded the Victoria Medal, the Service Cross, and the War Medal. Despite all this, she was a central target for anti-Semites, and their attacks ultimately forced her into bankruptcy and illness. The Empress sent her to San Remo to recover, but it was not enough. Morgenstern left the public sphere and spent her last years writing. Among her final works is a collection of 250 biographies of inspiring women. In those last years she also directed the German Peace Society, advocating for pacifism, arms reduction, and peaceful coexistence. Disbanded by the Nazis, the organization was reformed in 1945, and continues to operate to this day. Morgenstern quietly passed away in 1909, and is buried in Berlin’s Jewish cemetery. I only have one real man in my cabinet. This entry was posted in Extraordinary Individuals, Writers & Thinkers and tagged Berlin, Child Care, Children's Rights, Education, Feminism, Feminists, Franco-Prussian War, German Jews, German Peace Society, Germany, Health, International Congress of Women, Kindergarten, Pacifist, Philanthropists, Social Activism, Social Justice, Soup Kitchen, Wars of 1848, Women's Rights on March 7, 2018 by Jew of the Week.